- ¿ What is a Binary Plan ? MLM Binary plan is one of the most popular on the industry and widely accepted on the world. 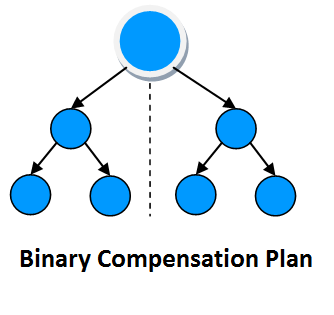 In Binary compensation plan every member is allowed to sponsor only two front-line members. If a member sponsors more than two members, the excess are placed at levels below the sponsoring members front-line (downline). This compensation plan is mostly used by health and nature product selling companies, there are many variations on how to setup a Binary plan, including how the distributor (the affiliate) earn money, there are usually bonuses for distributors who met some volume of sales from his downline, distributors are usually required to purchase a minimum amount of products per week/month, excess of sales can sum to the weekly/monthly volume or sometimes is shared to the upline on a unilevel system. - ¿ What features have the Binary Plan Edition ?